Chair with chromium-plated or painted frame. Hide leather seat and back, sewed or with laces. Designed in 1926 by Mart Stam. This cantilever was designed in 1926 and put into production in 1927. 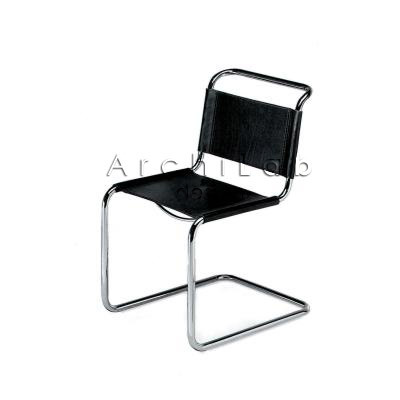 It is similar in form to a chair attributed to Breuer by thonet in their production of 1927-28. 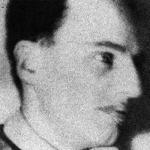 In a law suit of 1926-1932, the German court attributed the models to Stam. In the earliest Stam production version there was a horizontal bar between the front legs. In the Breuer version, as well as all later versions, the horizontal bar was replaced by a support under the seat. Once steel furniture became fashionable and bending equipment readily available, the cantilever and the sled-base (which is a cantilever on its side) became the most common tubular steel chairs. This was not because everyone was plagiarizing Mies, Stam and Breuer but because these economically efficient solutions were imposed by the technical limitations of the equipment available. Anyone who has ever been involved in the manufacture of furniture knows that designs are more often modified to fit existing equiment than vice versa.